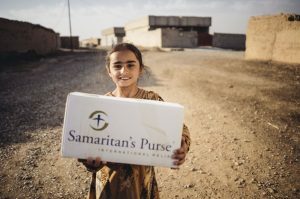 AMONG THOSE SAMARITAN’S PURSE HAS HELPED IS A WOMAN WHOSE KIDNAPPED HUSBAND REMAINS IN ISIS CAPTIVITY. Anka lost her home and her husband at the same time four years ago. When ISIS invaded the Christian town of Qaraqosh, Iraq, in August 2014, she chose to flee. Her husband Behnam stayed—at first—then tried to rejoin her days later but wound up being captured. Over the past few years, Anka has known little but suffering as she was displaced and anxious for news of her husband. Her hometown was destroyed; all that was left were ruins. 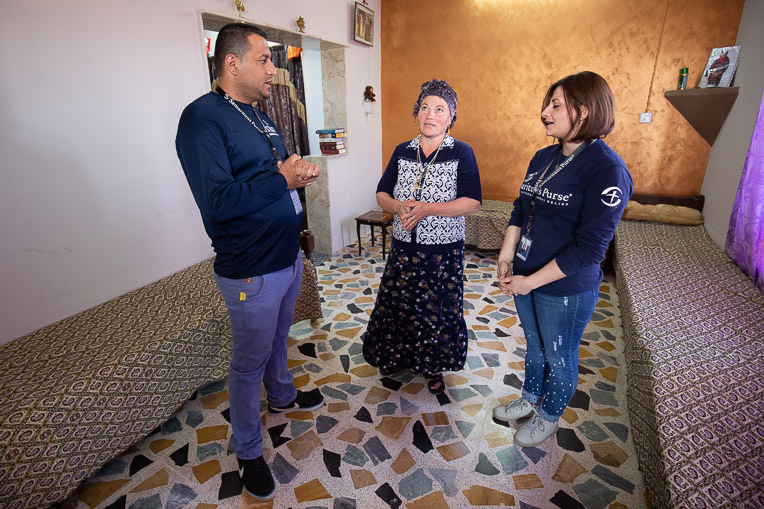 Recently some light has returned as she was able to move back home to Qaraqosh, thanks to Samaritan’s Purse. Our Nehemiah Project has rebuilt over 770 homes for persecuted Christians on the Nineveh Plains over the past year. Even though ISIS left her hometown a wreck, Anka longed to return. Because her house was under construction when the terrorists came, her best option was actually to return to her sister’s residence. The sister extended Anka and her family an invitation to live there in the historic Iraqi city. Anka agreed but the house needed repairs—work she couldn’t do herself. However, she soon was overjoyed to learn that Samaritan’s Purse would help her restore the home. 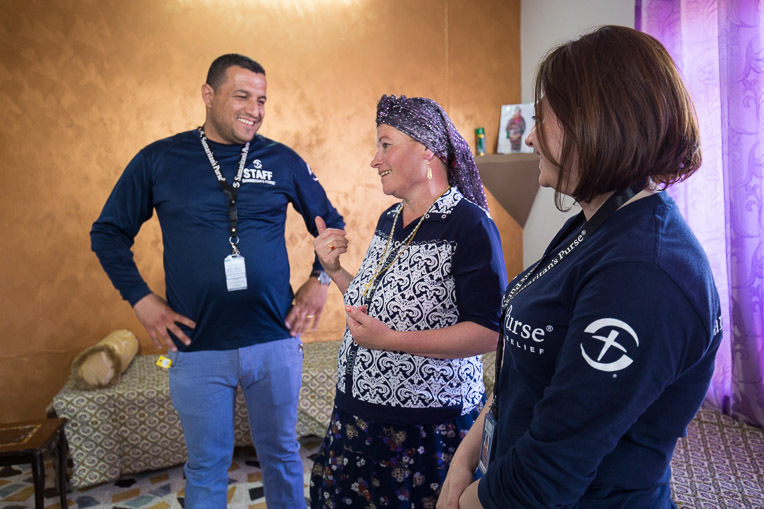 Anka (centre) and the Samaritan’s Purse staff talk and pray together in her newly restored home. Samaritan’s Purse repaired doors, windows, ceilings and the gate. We also added a fresh coat of paint. “Thank God for sending Samaritan’s Purse to help us,” Anka said. Now her restored home is one of hundreds that stand in defiance to the rubble around it. While Anka’s return home offers much comfort, the memories of 2014 still haunt her. Anka (second from right) enjoys time with some of her extended family members, who also live with her. “I’m staying here,” he replied. Anka left Qaraqosh for safety at 12:30 a.m. on 7th August 2014, hoping to be reunited eventually with Behnam. Three days later she received a phone call from him, and he said he was coming to meet her. He never made it. ISIS captured him. “It’s too hard to even cry,” Anka said. She said she doesn’t have any tears left. Occasionally that is encouraging news—like the phone call she received this April telling her that Behnam was alive in an ISIS prison. The Samaritan’s Purse team encourages Anka (centre) during their visits. Other times, the word is disturbing. During her wait for news of Behnam, someone sent her a photo of a dead man that looked like him. Early the next morning, she and her sons took a taxi from Erbil to Qaraqosh to investigate. “I went down and searched among the bodies,” Anka said. After turning over eight corpses, she discovered that none were her beloved husband. Please pray as the homes of more Iraqi Christian will be rebuilt through Project Nehemiah. People want to return quickly. Though the situation has improved over the past year, there are still many wounds—and situations—that need healing. Please pray for strength for Anka and for Behnam to be released soon.